In the nonfictional epilogue to her fictional travelogue Hav , Jan Morris ends with words from the German Romantic writer Novalis: "Novels arise out of the shortcomings of history." History's shortcomings are the impetus, material, and theme of Hav , a remarkably subtle book, a novel of indirections that presents an imaginary (and richly imagined) geography and history for a Mediterranean nation called Hav, a country that incorporates the potentials and mysteries of various real societies and cultures. Morris takes the details of recorded histories and visitable places and turns them into the stuff of a vivid dream, then uses the dream to meditate on the currents of history that shape the world we perceive as real, the present moments that get abstracted and represented by historians. But Hav is more than just a hoax-like gazeteer, and it is in this more that the genius lies. Hav builds up in our minds through an agglutination of details—details of buildings and people, of foods and clothes, of traditions and histories. We learn about the trumpeter Katourian, stabbed at the finish of a failed siege by Crusaders; we see the various buildings and institutions of government; we visit homes and cafés, a market and a draper's shop; we stroll through streets, learning their shapes and sounds and smells; we talk with people from all the various nationalities and ethnicities housed by Hav—the Muslims and the Christians, the Chinese and the Turks, the atheist monks, the indigenous Kretevs who live in splendid caves and are known by all as "the troglodytes," and the Cathars who hold secret, mysterious, myth-laden gatherings. "I know of nowhere in the world where the purpose of life seems so ill-defined," Morris's fictional self says in the third chapter, summing up a feeling most readers will have gotten from her peregrinations up to that point. The emphasis, though, belongs on the seems . We are given the surface of Hav, the naïve first impression of a place, and then that surface is complexified, and the first impressions, the fancies and fantasies, are unravelled, until what falls apart is not only narrator-Morris's own perception of Hav's truth, but the place itself. The imagined reality of Hav is a precariously balanced utopia, a place where the fault lines of cultures can exist without quite quaking—but then they do quake, and things fall apart, and Morris presents us with a narrator-Morris who cannot understand what has happened, who is left with only the option to leave, because such a society as she had construed cannot hold itself together, a fragment of impressions, a lost world that loses itself. All of the details, it turns out, were not the real story. The real story lies beneath and beside. An alert reader will remember details that now spring open like booby traps, revealing alternate readings, so that the book becomes a palimpsest of itself, a snake eating the textual skin it sheds. The last pages of the original Last Letters from Hav are unsettling in every sense of the word, and Morris was a bold and visionary enough writer then to let all ambiguities stand, to tie nothing up, to pretend no knowledge. Most of what was once unique about Hav has been either wiped out or commodified, and in the empty spaces left by destruction appear grandiose buildings and ridiculous resorts, the architecture of global capital, the concrete aspirations of an aesthetically blind and culturally tone-deaf regime determined to mold Hav into the shape of its own hubris. This brings the book close to satire, but satire needs some embellishment, and how embellished, really, is a society numbed by the gravitational forces of its orthodoxies? The Hav of "Hav of the Myrmidons" is recognizable to anybody who has stepped outside this morning. Nonetheless, there are still mysteries to Hav, and still wonders. The wonders now are hidden in the margins, and Morris glimpses them before, once again, leaving the place abruptly, with most questions still unanswered, most mysteries still intact. "Hav of the Myrmidons" works, then, not only as an extension of the story in Lost Letters from Hav , but as a reinterpretation. It reconstructs the foreground of the story from its background, giving us a similar structure and different emphases. Time has affected not only the place, but the narrator's reading of the place, and thus it affects our own re-reading. The book as a whole expands and expands again our understanding of the place described, and reminds us how limited this understanding is. The new section of the book gives Hav a newly vivid reality by preserving and extending the immensity of all that can't be known. The magnificence of Hav lies not only in the magnificence of Hav, which Morris has imagined with extraordinary care, but in the way the unreal place is used as a tool for perception. There is, first, the perception of the narrator, and most of the surface story lies there: we watch narrator-Morris observing, experiencing, and interpreting what author-Morris has dreamed up. The satisfaction of the book, though, comes with a perception of all that is below the surface, the mysteries and enigmas, the shadows behind the words. Much great fiction explores perception, and Hav is both an exploration and an exploration of that exploration—its depth and richness derive from all the nested implications, the endless possibilities. There is no "story" in the traditional sense of the word, though there are many events; the events are linked together, though, not so much by a sequence of actions as by a continuous perception. 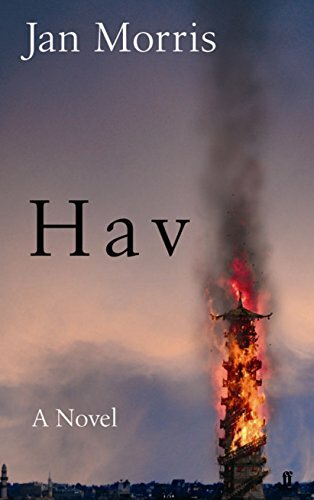 The main character of Hav is, indeed, Hav itself, and what we watch is the ways it changes, and the ways those changes are noticed and discussed by the characters who flit in and out of the book, and by the narrator, who is the only character to remain consistently with us. The narrative strategies mix elements from various sorts of memoir with those of eighteenth- and nineteenth-century "imaginary voyage" stories and utopian novels, plus some sleight-of-hand tricks learned from Modernist masters and Latin American magical realists, creating a book that could be described as the novel Borges might have written if he'd been inclined to write a novel (and been more politically astute). Except such a statement, though it perhaps conveys a certain sense of Hav , is too reductive for what Morris has accomplished here in a book that is quietly but consistently true to its own internal logic, and to the vision it presents. The proof of Hav 's excellence lies in its inability to be summarized in any satisfactory way. The book, then, is like the place it describes: impossible to pin down, an evocative enigma, a dream construction that spreads itself beyond the borders of a dream. Matthew Cheney's work has appeared in a wide variety of venues, including English Journal , Locus , SF Site , Rain Taxi , Failbetter.com , and Rabid Transit . He writes regularly about SF and literature at his weblog, The Mumpsimus , which was nominated for a 2005 World Fantasy Award, and he is the series editor for Best American Fantasy from Prime Books. You can also find his work in our archives. Matthew Cheney's previous interviews include such writers as Lydia Millet, Jeff VanderMeer, Leena Krohn, Jeffrey Ford, and Kit Reed. More of his work can be read in our archives.